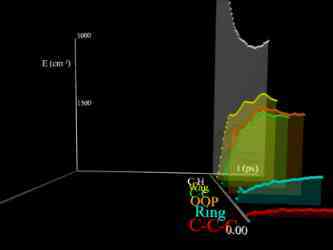 This animation illustrates the quantized energy levels of the benzene molecule. The molecular dynamics were computed using the force field developed by Maslen, Handy, Amos, and Jayatilaka1. This force field contains terms out to the fourth-order. Our calculations also include fifth- and sixth-order terms published by Wyatt and Iung2. The study3 investigates the quantum dynamics of overtone relaxation in 30-mode benzene. The animation depicts the total energy in each of the six classes of local mode vibrations. For example, the energy in the six C-H stretch modes are collected into a single term in the graph labelled "C-H". At time t = 0, we choose the bright state to be one of the E1u symmetry states. We then propagate time through 1 picosecond and follow the energy flow through the other local modes. Clearly at very early time, virtually all energy is in the "C-H" stretch mode, and this component of the graph is off-scale. The in-plane C-H wag ("Wag"), out-of-plane C-H bend ("OOP"), and C-C stretch ("C-C") modes acquire energy early in the simulation, while the C-C-C bend mode ("C-C-C") and the C-C-C-C ring torsion mode ("Ring") acquire relatively little energy during the duration of this animation. Note especially that the out-of-plane C-H "Wag" mode acquires a considerable amount of energy after only a few femtoseconds in the simulation, and maintains this energy level for the duration of the animation. The computations were performed by Todd J. Minehardt, Robert E. Wyatt, and J. David Adcock using lonestar, a Cray T3E Massively Parallel Computer system. This animation was produced by David Adcock, a graduate student in the Wyatt research group. The graphics were rendered using the POV Ray Version 3.0.1 program. For more information, send e-mail to david@quantum.cm.utexas.edu. 1. P.E. Maslen, N.C. Handy, R.D. Amos, and D. Jayatilaka, J. Chem. Phys. 97, 4233 (1992). 2. R.E. Wyatt and C. Iung, J. Chem. Phys. 98, 6758 (1993). 3. T.J.Minehardt, J.D. Adcock, and R.E. Wyatt, J. Chem. Phys. 110, 3326 (1999).